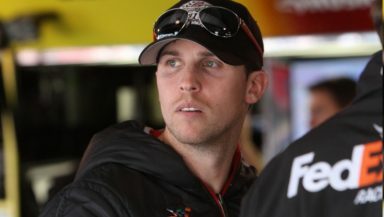 A March 26th press release issued by Joe Gibbs Racing brought the good news that Denny Hamlin fans were hoping to hear. According to that press release, “Denny Hamlin will race this weekend at Martinsville Speedway after NASCAR received official confirmation from his doctors that he has been medically cleared to return to regular racing activities”. NASCAR fans were stunned last Sunday, at the Auto Club Speedway, when it was announced that Hamlin was in the speedway’s infield care center and was not going to receive medical clearance to race in the Auto Club 400. Hamlin first visited the infield care center at Auto Club Speedway Saturday night bothered with an irritation in his eye. He returned to the infield care center again on Sunday morning because his condition had worsened. It was first believed that the driver was suffering from a serious sinus infection that was impacting his vision. The doctors at the infield care center referred him to the local hospital for further evaluation. It was there that doctors discovered a small piece of metal in Hamlin’s eye. Once the Doctors removed the sliver of metal, Hamlin felt immediate improvement to his condition. As a precaution, doctor ordered a CT Scan which thankfully did not find any other complications. Hamlin was released from the hospital Sunday afternoon and was given the doctor’s approval to fly home. Hamlin was then evaluated by a doctor in the Charlotte, NC area on Monday followed by an additional evaluation the following Wednesday. It was that second evaluation that brought the good news from the doctors who informed Hamlin, as well as NASCAR officials, that he was official clear to resume all racing activity. HERE’S ANOTHER VERY POSITIVE MEDICAL REPORT. Congrats and God bless to NASCAR Sprint Cup driver Matt Kenseth and his wife Katie who welcomed a new bundle of joy Tuesday evening with the birth of the couple’s third daughter. Clara Mae Kenseth was born March 25 at 7:39pm/et weighing in at eight pounds and five ounces. Both mother and daughter are doing well as the family enjoys the latest addition who joins the couple’s other daughters Kaylin and Grace, along with their son Ross. Kenseth will be able to spend a few days at home with his brand new baby girl before traveling to nearby Martinsville, Virginia for this weekend’s STP 500 Sprint Cup Series event at the Martinsville Speedway.